In my trip to Munich in November 2017, I happened upon a speciality spirit shop. As usual, a lively conversation about different whisky distilleries ensued. However I had a very specific quest – to try and find something I could not buy anywhere else. DeCavo fit the bill perfectly. Now the challenge is that the very thing that makes an unusual whisky so interesting… also means further details can be elusive. Above all… what matters most to us is what did we think? Nose – Yum! Banana – to be more precise cooked and caramelized banana crepe, bubblegum, berries, banofee pie, cinnamon candy… after some time unmistakable coconut like Malibu rum! Or that Hawaiian Tropic suntan lotion… Kept shifting into a bit of bay leaf, worm wood, vanilla… and even rum with Christmas pudding notes. Delicious nose! There was absolutely no doubt this was the surprise of the evening! And an absolute delight. I don’t think anyone imagined how much we would enjoy this German dram. It was truly exceedingly tasty and what an interesting inviting nose! Jim Murray not only helped us fill the first barrel, but also tested our DeCavo Hand Crafted Single Malt and added it to the whiskey Bible. We are looking forward to an outstanding 91 out of 100 points. Together with an indication of the impressive quality of the distillate, which has already been ripened for several months, and the explanation that he can hardly wait to be able to rate it as whiskey in two years. He describes the taste of the DeCavo Hand Crafted Single Malt as a citrus-toning, attractive, oily, juicy, malty and “smacking delicious”. In addition, he points out that bottlings with such a high score fall into his personal category “brilliant”. This bottle was purchased at Wien Laden in Munich in November 2017. Belgium – Gouden Carolus 3 years 46% – Bonus from our host! 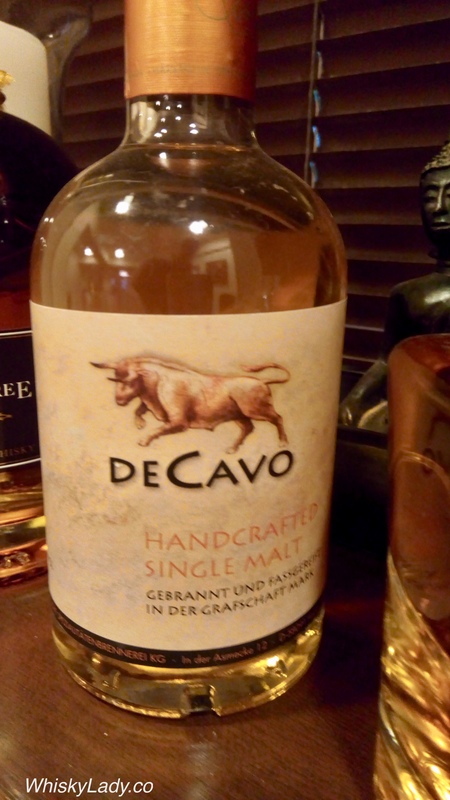 This entry was posted in Beyond Scotland, Germany and tagged DeCavo, DeCavo Single Malt, DeCavo Single Malt 46%, German by Carissa Hickling. Bookmark the permalink.